TODD DAVIDSON – Coram, New York. N scale Micro Trains model. I used a photo from http://www.rrpicturearchives.net of the actual car to get a basic idea of how it has been weathered in real life. To begin, I was all ready to apply dullcoat before I applied the PanPastel, however, I decided to test how they would adhere without it. To my surprise, the PanPastel Colors adhered beautifully and I never had to apply the dullcoat. Finally, not that beating the clock is my goal when it comes to modeling, I was amazed that I had my first car completed in under 10 minutes, Now that I have my first weathered car under my belt, I feel very confident that I can move on to the rest of my fleet of rolling stock and locomotives. This is an RTR Intermountain model that I stripped the lettering off and painted with Floquil® Primer. The model is close to the Rock Island version of the ACF 1958 cu. ft. car. I sanded the primer coat some, then applied the decals. The road name, initials and number are from a Walthers alphabet set. The data is from a Micro Scale Milwaukee covered hopper set. I wanted the car to look like it had had its initials, number, and weight data re-stenciled after years in cement service. I lightly sanded the road name and dimensional data. I painted a Floquil gray onto blank decal paper, cut out pieces to fit between the ribs and added the appropriate decals over the ‘repainted’ places. The car was weathered with a Polly S white wash. PanPastel Neutral Grey Tint was stippled into the wet acrylic paint on the roof with a stiff brush to get the texture of caked on cement. I like to apply PanPastels with a fan brush then blend with a soft cosmetic sponge. I used that technique on the sides and underside. I stippled a dark Red Iron Oxide PanPastel on the sides where the paint had been chipped off by beating the car sides with sledge hammers. The rust color was also brushed on the hatch levers and hoppers. Lastly Testors® Dullcoat was airbrushed on the model. I need to acquire the correct hand wheel and trucks for the car before I can call it complete. 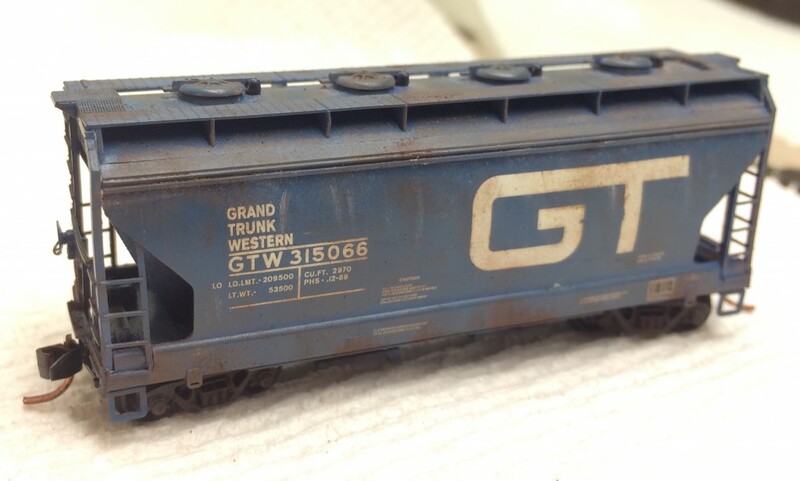 BOB SANTOS (Harrisburg, PA) – G scale camelback weathered with PanPastel Colors.